On November 10, 2016, on the occasion of the World Science Day for Peace and Development and in partnership with the United Nations Educational, Scientific, and Cultural Organization (UNESCO) and the International Council of Museums, science centers, science museums, and their networks worldwide will organize the first International Science Center and Science Museum Day (ISCSMD). On that day, science centers and science museums are invited (and encouraged!) to offer activities based on one (or more!) of the 17 Sustainable Development Goals (SDGs) declared by the United Nations (UN). Building upon that UNESCO theme of “Science for Peace and Development,” our goal is to create new ways for our institutions to proactively address global sustainability while reaching increasingly diverse audiences. ISCSMD aims to demonstrate the engagement and impact of the science center and science museum field and to present them at the Science Center World Summit in Tokyo in November 2017. As we start to mobilize for ISCSMD, we invite individual science centers and science museums to begin an online dialogue about the event. Help us bring the conversation alive by submitting a blog post and letting all of us know what is working (or what you’d like to improve) in your center relative to the UN Sustainable Development Goals. How can you start? Identify one goal (or more!) linked to an exhibition or a program that you currently offer or plan to undertake. Share your successes, challenges, and ideas for change, either that you’ve already made or hope to make. Your posts—and the discussions that result—will not only inspire comments from the field, but will be used to set the stage for the aforementioned expert-led mini-conference. Plus, when the official ISCSMD website is launched in June, your entries will help make it come alive. Our first post below describes how Telus Spark (Calgary, Alberta, Canada) seeks to be a place where rich conversations around sustainability can happen through their Energy Sustainability Project—a pilot exhibit designed test to their visitors’ interest in these topics. TELUS Spark is located in Calgary, Alberta, Canada, a city known for its cowboy heritage and fossil fuel economy. We opened our new facility in 2011, and moved out of our 1967 planetarium-turned-science-center. During these past few years, with the ups and downs of the economy and radical changes in political direction, many Albertans are closely examining the prospects for our carbon-based economy and are struggling to link these to a positive future for their families. It is not easy to see good indicators of stability when tens of thousands of people have been laid off work in the past year. TELUS Spark strives to be a role model and a force for innovation that drives positive change. For the past six months, we have been experimenting with creating opportunities for public engagement on the often competing issues of energy, economy, climate, and the environment. We seek to be a place where rich conversations around sustainability can happen through our Energy Sustainability Project. Creating an opportunity for visitors to become aware of the United Nations’ 17 Sustainable Development Goals (SDGs) is a natural fit with our work, but a potentially challenging and complex topic to address. We at TELUS Spark believe that the positive transition to a sustainable energy system is founded on increasing the awareness, understanding, and commitment of individuals to integrate sustainability principles into the way they live, work, and grow the economy. What would happen if we chose to focus some attention on the UN SDGs? Would people be interested? Would they even care? We have a tradition of fast, inexpensive pilot testing of concepts—think Sharpie markers and cardboard graphics (really! )—so we quickly got to work. The UN has already made the SDGs graphics visually attractive and easy to use. 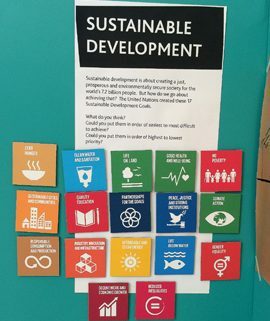 The pilot was very simple; a brief summary paragraph about the UN’s Sustainable Development initiative, enlarged graphics of each of the goals, and a “call to action” instruction. The numbers on each goal were masked. We mounted each goal on foam core and attached a Velcro strip to the back. The instructions were adjusted to see what impact they might have: visitors were asked to rearrange the goals from highest to lowest priority, or from most easily to least easily attained. Despite the display being small and having little surrounding context to build meaning, the goals were constantly rearranged for the duration of the display. Given that this was one of several rapid pilot tests in our Energy Sustainability program, we did not do significant evaluation. We were looking for basic attractors and responses to a wide variety of subject matter. 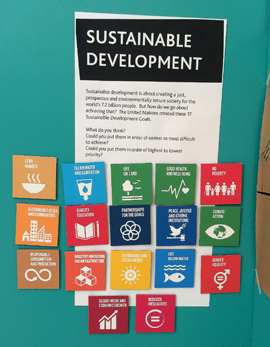 From our collected observations and feedback, we learned that the Sustainable Development Goals are actually pretty hard for our visitors to understand. We also learned that it is challenging for visitors to find personal relevance when faced with this information, let alone form an opinion. From abstract, yet clear and meaningful goals, it is difficult for our visitors to imagine what actions could lead to positive change. As we pursue this further, we will need to go from mere awareness of the SDGs to concrete examples of projects that address one or more of the 17 goals. As we go forward with our Energy Sustainability program, we are addressing coal-fired electricity, renewable technology, and technology innovation in the Alberta Oil Sands to reduce CO2 emissions. There is too much content to cover, but perhaps the SDGs will help us frame the priorities. We wonder if first taking a collaborative approach to SDG awareness might be beneficial. What would we learn if we all presented a similar challenge, like “put these goals in the order from highest to lowest priority”, and shared our audiences’ responses across the world? What is important in our community will likely be very different from yours. There are many stakeholders in our energy system and many forces that are beyond our control. As new technologies become available, people will have to make choices about which ones they will adopt and how they will use them. Science centers are good at raising awareness of the science behind technology. They can also allow for reflection on the broader consequences of the direction in which humanity is moving, and consideration of the global impacts of our choices. By doing so, we ultimately further serve as cultural institutions by being places where shared social constructs and understandings can be encountered and deliberated.